Deadpool Team-Up #897 comes out tomorrow, January 6, 2010. 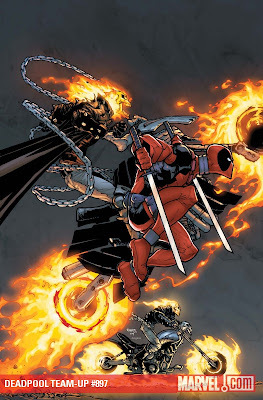 This issue teams Deadpool up Ghostrider, and is written Adam Glass with pencils by Chris Staggs. Glass co-wrote some of the issues of the Deadpool: Suicide Kings miniseries.